This V-nose fifth wheel offers better wind resistance and a separate cargo area with 12'6" of toy hauling space. You will be able to take along your favorite toys and relax in comfortable accommodations anywhere you decide to set up. Having two exterior entry doors allows you easy access to your gear and to the kitchen. The separate cargo area provides a power bed and dinette, a loft above, a side man door, and an interior door into the main living area. You will have two rooms to entertain other campers, and the U-shaped kitchen provides all the appliances necessary to make meals for the gang. You will surely appreciate the double entry bath, and the king bed in the master bedroom. Step inside! 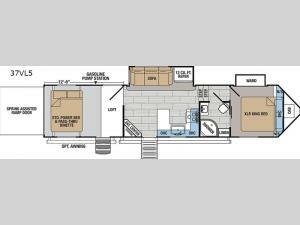 Each XLR Nitro toy hauler fifth wheel by Forest River offers inside comforts such as upgraded residential furniture, large panoramic windows, a modern sink with a grate style sink cover, and decorative glass inserts in the upper cabinet doors in the kitchen, to mention a few standard features. The exterior includes performance fiberglass, vacuum-bonded aluminum framed side walls, 102" exterior width, and the Xtended Season Package allowing you to travel whenever you like, and the Ultimate Package 2 with several features such as the off-grid prep, the MorRYDE CRE 3000 suspension enhancement, the 5,000 lb. rated D-rings in the garage area, and more!